The lesbian trailblazer and multiple Grand Slam winner wrote a column in the Sunday Times of London that leans into transphobic rhetoric. Trailblazing lesbian tennis champ Martina Navratilova, who was already criticized for an anti-trans tweet in December, has now penned a column about trans athletes in the Sunday Times of London that feeds into hateful anti-trans rhetoric. 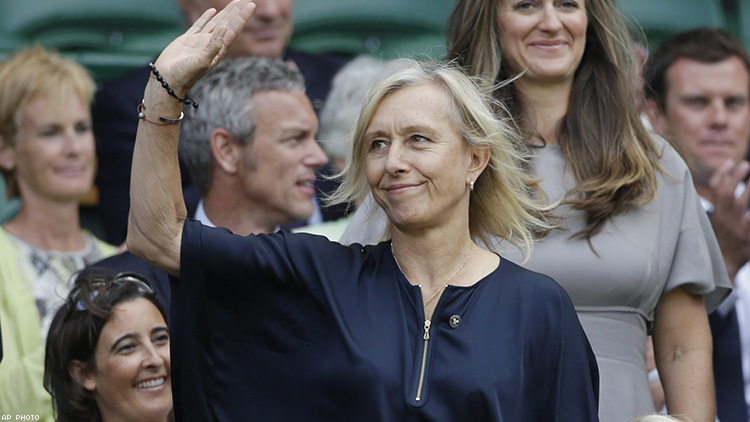 Navratilova, who came out publicly in 1981, began the column by reiterating that she had gotten into a Twitter scuffle over a Tweet she’d posted about trans athletes. At the time, trans track cyclist Rachel McKinnon, who last October became the first trans woman to win a world title in her sport, went after Navratilova for her statements. The tennis star deleted the offending tweet and said that she would “educate” herself. But in her column in the Sunday Times, Navratilova doubled down on her anti-trans statements writing, “Ever the peacemaker, I promised to keep quiet on the subject until I had properly researched it. Well, I’ve now done that and, if anything, my views have strengthened,” she wrote. “To put the argument at its most basic: a man can decide to be female, take hormones if required by whatever sporting organization is concerned, win everything in sight and perhaps earn a small fortune, and then reverse his decision and go back to making babies if he so desires,” Navratilova wrote. The International Olympics Committee, in 2016, adopted guidelines for trans athletes that did not mandate that trans athletes undergo gender reassignment surgery in order to compete. While there are no restrictions placed on trans male athletes under IOC guidelines, trans women are required to show that following hormone therapy, their testosterone levels have fallen under a specific amount. But that restriction doesn’t go far enough for Navratilova. In a tweet about Navratilova's column, McKinnon called out her transphobia.